Queerbook, What's In A Name? 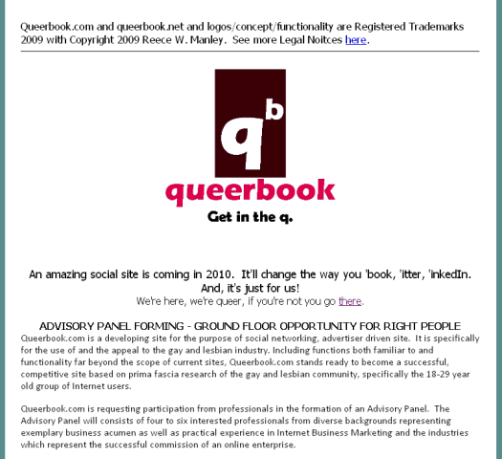 When the GLBT community launches their social network in 2010, do you think the name "Queerbook" is an appropriate handle? Reece W. Manley, the founder thinks so as he has registered trademarks for Queerbook.com and Queerbook.net, in addition to establishing their logo. According to their press release, "the term 'queer' was found to have an 81% acceptance rate in two markets among GLBT sites, with a willingness of 98% to participate on Queerbook.com was also discovered." Additionally, the name alone appears to be a major drawing card. According to Google Analytics, the site's hits have reached in the hundreds of thousands without and advance marketing or advertising. Since its emergence in the English language in the 16th Century, the derivation of the word 'queer' came from the German word "quer" meaning "across, at right angle, diagonally or transverse." It wasn't until centuries later that 'queer' came to mean "strange," "unusual," or "out of alignment." Subsequently, during the early 20th Century, its usage was considered controversial as "queer" was frequently used as a derogatory term for effeminate gay males.Towards the latter half of the century, while the term was still considered by some to be offensive and derisive, others re-appropriated it as a badge of honor to describe one's sexual orientation, gender identity and as an opportunity to underscore one's self-empowerment. 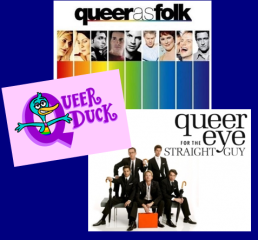 Queer TV ShowsSeveral television shows, including Queer Eye For the Straight Guy, the cartoon Queer Duck and the British and American versions of Queer as Folk, have also used the term in their titles to reinforce the positive self-identification message. This commonplace usage, especially in the American colloquial culture has recently led to the more hip and iconic abbreviation "Q". Which brings us to the formation of the soon-to-be Queerbook social network with a "Q" in its logo. In anticipation of the roll-out, Reece Manley is forming an Advisory Panel, consisting of four to six Reece Manleyinterested professionals from diverse backgrounds representing exemplary business acumen as well as a practical experience in Internet Business Marketing and industries which represent a successful commission of an online enterprise. According to Manley's work-in-progress Web site, "if you are a gay man or lesbian, and live out, openly and proud," you are welcome to apply as an Advisory panel applicant. Once accepted to the panel, you will be able to vote on future members of the panel and will be entitled to a $10,000 bonus upon corporate funding, with an future net earnings equal to 18% of ongoing net revenues for the site or as set by the panel. So appropriately name "Queerbook" is off to a productive start. After launch, it will be interesting to watch how it scales up against Facebook and LinkedIn, the two networks it appears to be emulating. Thanks for the kind words and implied best wishes! We are very excited and very close to naming the Advisory Panel. Anyone else wishing to add their vitae should send it in as soon as possible to reece@manley.net. Are transgender/transsexual or bisexual people also allowed to be on the advisory panel? Just wondering, since Queerbook is marketed as a GLBT social network but Manley's statement about applicants only addresses gay men and lesbians. This will go no where named "Queerbook"
This will go no where named "Queerbook." Its a dumb name and people won't want to be associated with it. Better test market that name again.